Miss Rosanna Trestman of Connecticut returned to Crystal Creek Lodge in search of a King Salmon to exceed her personal record of 42 inches, set in 2014, but, alas, she didn’t beat her record, yet she still caught some nice Kings and Sockeye Salmon. 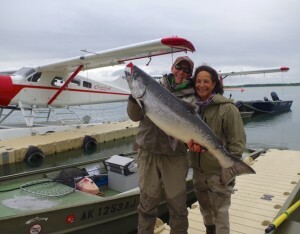 Here is Rosanna with her best King of the week, held by guide Ryan Burge. Rosanna, by the way, has found her real King, her fiancee Jaime Childs. She and Jaime are to be married August 8.